Radiator Springs Racing Research and Development team is really proud to present the new, upgraded version of the RSR Live Timing. The aim of the RSR Live Timing App is to bring a fair, clean, live hotlap competition to Assetto Corsa. It was not a simple update of the old one, but a complete newly written app, management system and website. Our new website is collecting statistics on what you do on track, and gives a lot of details of your laps. This website will be the base for further developments in the upcoming period. Our focus will be not only on having a rank website, but also to host multiplayer online races and championships. We have already a list of new features we want to include, but suggestions and criticism are welcomed. The app/website is fully integrated with Assetto Corsa GUI and Steam. So all you need to do is make sure that your personal details are filled in, and go on track. On the website, logging in with your steam account, you will get an interface personalized for you. You can find a detailed guide here to show you more details about the application/website. Fulvio "Gek" Genova and Luca Mosca for the initial idea and implementation of the RSR live timing for the TP, and again Fulvio and Andrea Lojelo for the new implementation of the app/management system, Gergo Racz for the website, Giancarlo Graziano for the graphics. Thanks to Aristotelis Vasilakos and Dom Duhan for their advices, and to the RSR Team and the testing team for their help. - APP: Make sure you fill in Name & Surname in your AC GUI. Setting the nickname only will not work at the moment, due to a bug in AC API. Check our website and download the application and see your laps. 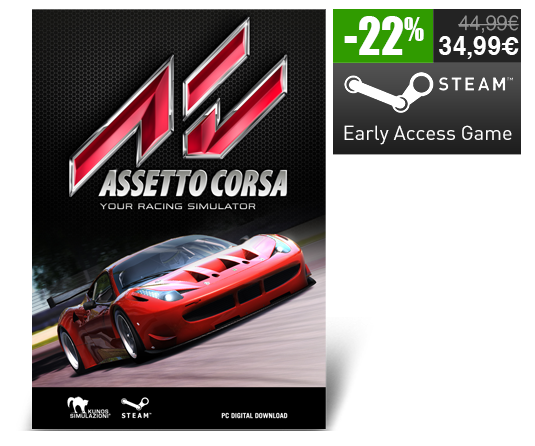 Assetto corsa Steam Early Access is out! Dear followers, finally the AC release is very close. The Assetto Corsa's official site, www.assettocorsa.net is under maintenance: when it will come back online, all the information about the game, its contents and features, the hardware requirements and much more, will be finally available. https://www.facebook.com/Assetto.Corsa/posts/726358147390506), we have had to change some assets of our strategy, finding the solution that will make you happy and will let the development team complete its job as soon as possible, and at its best. Assetto Corsa will be available on Steam Early Access very, very soon. The game will cost 34,99 Eur (allowing to save 22% of the retail price!) and will give you access to the beta version, including its updates, plus the final version. The latest news is that we have decided to include the Spa-Francorchamps track and three additional GT cars (Mercedes-Benz SLS AMG, Mercedes-Benz SLS GT3 and Lotus Evora GTC) in the main build of the game, to offer to you the best selection of cars and tracks that we are able to deliver, without any additional cost. We hope you appreciate it. Thanks to this addition, Assetto Corsa will include in total 35 cars, 16 vehicle classes, 11 circuits and 3 additional scenarios. Other extra contents will be added in 2014, in order to guarantee a long-life to this simulation. The first build of Assetto Corsa includes the main structure of the game and 8 classes of cars for a total number of 11 vehicles, with the aim to guarantee just from the beginning the chance to enjoy the dynamic model of the game racing with different kind of vehicles. As part of the early access program, an update with new cars, tracks and features will be available every two weeks, adding new contents and improving the existing ones. All the vehicles and tracks will be released in a level of completion close to the final one, with the aim to deliver, starting by the first version, an enjoyable and satisfying simulation, featuring cars and tracks reproduced at their best, with the exception of unknown minor bugs that will be fixed and polished in time for Assetto Corsa 1.0. During the whole process, the AI, Multiplayer and damage model features will be progressively added in the scheduled time, in order to close in short time the final release, that will include the career mode and other exclusive contents. To offer a even better service, we've decided to move to a new, much more powerful server. 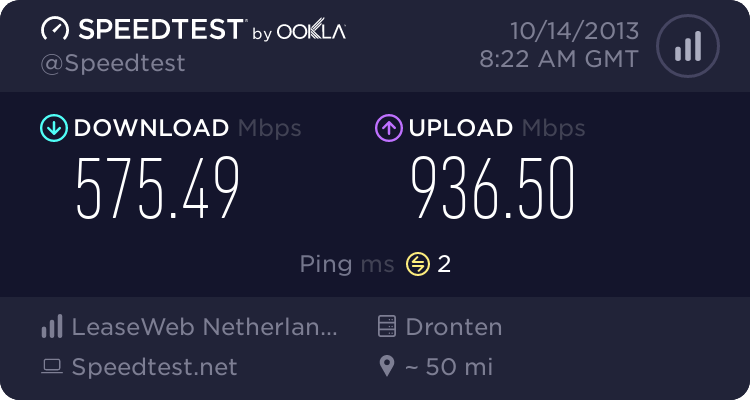 We've taken the strategic decision to find a server in data-center in Amsterdam, closer to the huge internet backbone to the States, and main hub for Europe. This should result in a much faster and stable server for both European and non-European users. Hopefully this will help us to offer a quality service for our new championships with Assetto Corsa.